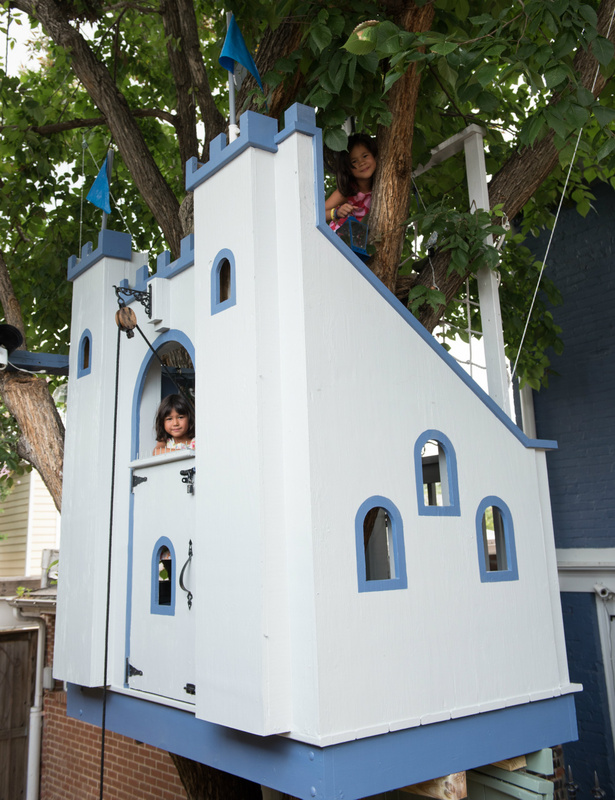 A Construction Permit Authorizes this DIY 30 SQF Tree House off a Capitol Hill Alley. Yet the DC Government has Tasked 7 Senior Attorneys with the Job of Getting it Torn Down. We're Calling it Absurd Government Waste. 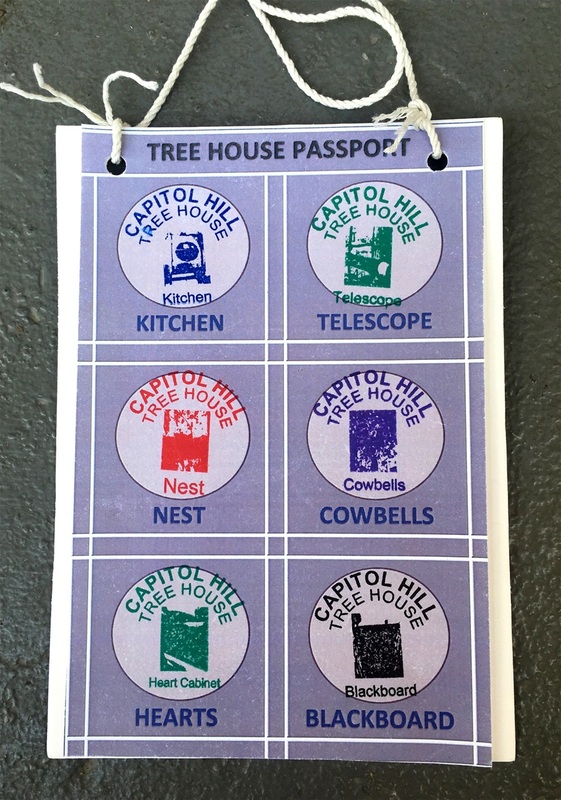 This BLOG appeared in early 2016, several months after the DC Department of Transportation (DDOT) had issued us, Capitol Hill tree house builders, with a public space construction permit and let that authorization close out. That spring, we realized that neither of the zoning commissions that had come at the tree house over the winter--the Advisory Neighborhood Commission 6B Planning & Zoning Committee and the Public Space Committee (PSC)--had the authority to overrule building permits. At that point--please excuse our gall--we decided to spread the word that the the District is known to demand that homeowners like us demolish projects covered by valid permits, or face enormous progressive fines for failing to comply. Permit holder beware. In January 2018, the COUNTER at the bottom of this page had tallied fewer than 10,000 hits. That was before the Post reported that we'd countersued DDOT, in Federal court, to challenge the agency's denial of due process in tree house permitting. The page counter now records over 42,000 hits, nearly four years into the District's campaign to destroy the play castle. Whatever has brought you here, thanks for stopping by - we appreciate your interest in the tree house. If you're a tourist who wants to get off the beaten path on Capitol Hill, come find the play fort at 516 Archibald Walk SE off F Street Terrace. On 12/28, the popular DCist: News, Food, Art & Events blog RAN A FEATURE on Not-in-My-Back-Alley squabbles in DC. Deane Madsen, architectural writer, brings readers up to date on the "Capitol Hill Tree House Affair," with the first media report poking fun at DDOT's incompetent permitting work. The witty Madsen notes that DDOT sent citations to a "non-existent Mr. Lee," to fine him ($8,000) for failing to tear his tree house down. This past fall, WTOP reported on a Council of DC hearing at which DDOT LEADERS were called to task by the members of the Committee on Transportation and the Environment for failing to make adequate progress in implementing the agency's Vision Zero initiative. The ambitious scheme has the goal of reducing annual traffic deaths in the District to zero by the year 2024. Sadly, there were at least 34 road fatalities in the District last year, after an increase in traffic deaths each year since 2012. We believe that taxpayer funds allocated to DDOT should be spent to bolster PUBLIC SAFETY. The leadership of the agency's Public Space Regulation Division has lost persepctive on DDOT's core mission in tasking a team of attorneys with destroying a backyard kids fort. The homemade tree house, built nine feet above our patio and a public-private mulched tree box, neither obstructs travel nor poses a threat to the public. Nonetheless, one DC lawyer after another has been given the unenviable job of ensuring that the small structure is "abated" (read demolished) from slightly overhanging unpaved public alley space. See Castle Paper Trail for a list of the seven District lawyers who, embarrassingly, have authored tree house briefs. Remarkably, the attorneys list includes a Deputy AG and the DC Solicitor General. 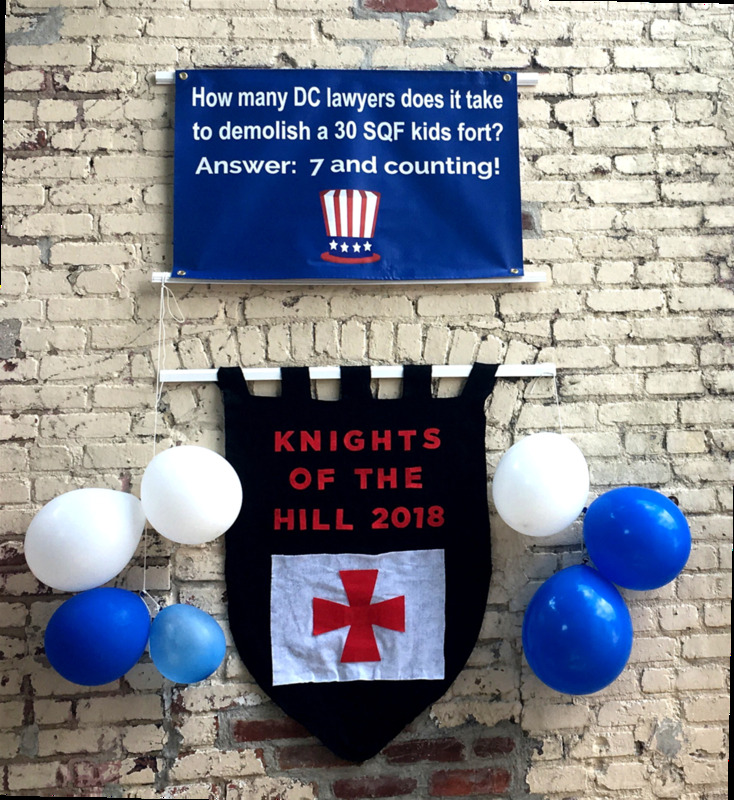 DC's ludicrous campaign to wreck a kids fort BUILT FOR AROUND $1,500 has already cost taxpayers six figures, mainly in senior staff time. The City circles the wagons in a trifling zoning matter to warn homeowners not to challenge permitting wrongdoing, the stuff of political farce. Little kids age out of their play forts, and then families take them down, irregardless of the resources thrown at destroying a particular structure. DDOT's over-the-top REACTION TO OUR CHALLENGE to the agency's abuse of authority in unlawfully withdrawing our permit clearly stems from from Post coverage of the story: the newspaper has run several news stories and two opinion pieces on the tree house. The result? At an inconsequential hearing at the DC Court of Appeals last fall, the City turned up with four lawyers to contend with us, ordinary citizens representing ourselves in litigation. The hearing wasn't the first time that the District had trained extraordinary legal firepower on a kids fort. Last year, several District attorneys, a DDOT division chief and a senior forester all attended a dead-ended, six-hour-long court mediation session. Yet DDOT could have ended litigation at any point along the way, freeing up City lawyers to do real work in the public interest, simply by agreeing to let the tree house alone while our girls are still young. To date, none of the CITY COUNCIL MEMBERS on the Committee on Transportation and the Environment (with DDOT oversight authority) has indicated a willingness to challenge the nutty government waste in question, a team of OAG attorneys trying to get a child's fort torn down, year after year. The same can be said of ANC 6B's leadership. Nonetheless, we will continue to ask our elected officials to challenge the waste. 1/28/19 marked the 3rd ANNIVERSARY of the PSC meeting at which the Chair, a DDOT official, tore up the closed permit authorizing the tree house in plain sight. Our message to the City has been that whenever permitting agencies unlawfully revoke a building permit like that, the District's investment climate takes a hit. We hope that this bizarre little zoning case has helped expose DDOT permitting incompetence and ingrained homeowner-hostile practices. If other homeowners are better able to defend rights conferred by public space permits in the future, as a result of our having challenged DDOT bumbling and wrongdoing, litigation will have been a small price to pay. Ward 6 Cub Scout, Daisy Scout and Brownie Scout leaders, please contact us if you're interested in bringing your den or troupe to the tree house for an educational BIRD WATCHING session. Click on Birding Activities for more information. Many thanks to everybody in the 'hood who stopped by the 3RD ANNUAL JULY 4TH OPEN HOUSE, the best yet, on a scorching day. Around 200 Capitol Hill people of all ages turned up for cake and lemonade after the Community Parade on 8th St. More than 80 arboreal travelers, ages 3-10, collected stamps in "tree house passports" in the elm, and many fired off nerf arrows on the south arm of Archibald Walk. The atmosphere was joyous - what a morning to remember! See Photo Gallery for some fun pictures. The story about the federal countersuit was scooped by none other than the DC URBAN REAL ESTATE BLOG. Their report emphasizes that we are challenging DDOT's denial of due process in construction permitting. Find a complete list of annotated tree house-related media links--there are four dozen--under Press Coverage. 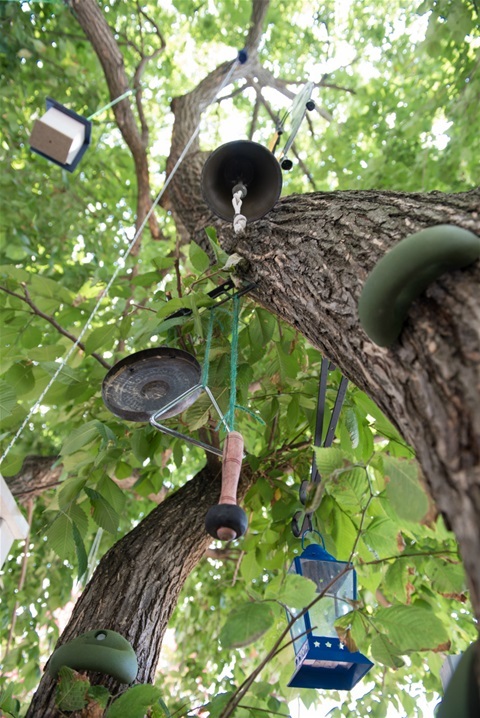 July 2015: Ellen Psychas and Bing Yee, longtime Hill residents, ask permiting officials which authorizations will be required to build a tree house at Archibald Walk SE, several blocks south of Eastern Market. The proposed kids fort would project over the tree box abutting their lot off an alley from which vehicles have long been banned. The creative design would enable the builders to use a tall wooden fence with posts laid in concrete as supports, minimizing the drilling of 18-inch lag bolts into a century-old elm. They learn that there is no reference to kids forts in the DC Municipal Regulations (DCMR) or Historic Preservation Rules. They show officials project plans and are told that DC does not permit structures with footprints of less than 50 SQF. 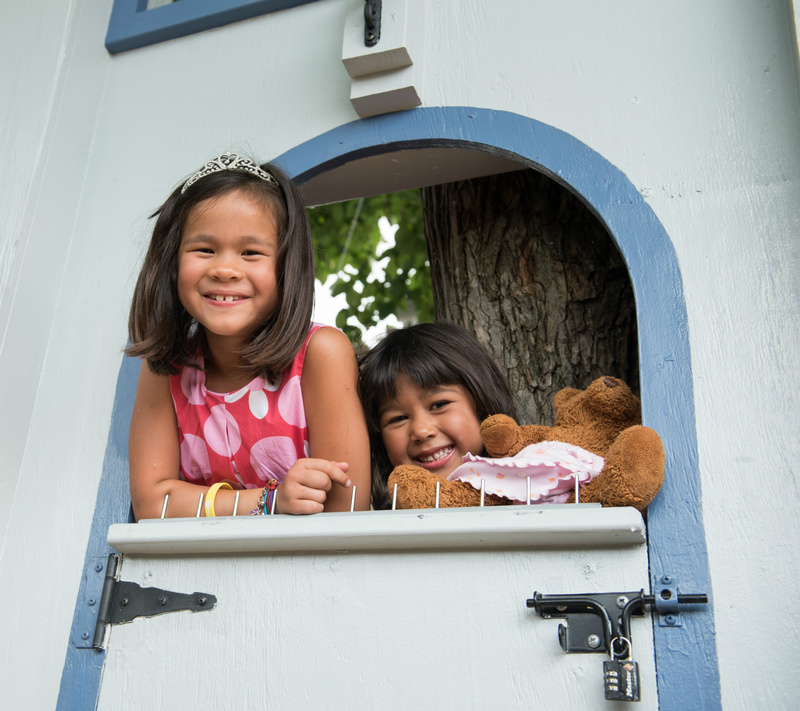 August-September 2015: The tree house is built for the Yee girls, ages 3 and 5, by relatives and family friends. Immediate neighbors are left courtesy notes telling them that a non-permitted fort will go up in the backyard elm tree, whose branches extend over alley space. None react. The 7' x 4' tree house cannot be viewed from a street. October-November 2015: One Archibald Walk neighbor complains to DDOT that the fort was built in a public tree, and constitutes a public nuisance (both untrue). A senior public space management inspector visits the alley and directs the parents to apply for a permit for the tree house to extend 20 inches into public air space over mulch. The parents do as instructed right away, quickly securing the permit. The DDOT City-wide permitting manager chooses the type and length of the authorization, which closes out on Nov. 20th. This is the parents' first public space permit in any jurisdiction. December 2015-January 2016: A dozen alley neighbors and local supporters sign a tear-down petition addressed to Advisory Neighborhood Commission (ANC) 6B. The full ANC reviews a permit "renewal" application the parents did not submit for a "proposed tree house" that's stood for months. The "renewal" is of a "balcony construction" permit under a Dept. of Consumer and Regulatory Affairs (DCRA) code, clearly a permanent permit, vs. a limited-duration "public space rental" permit, e.g. for a street festival or temporary parking. The parents had not been instructed to submit to City review before being issued the permit. The language of the permit does not state "temporary" or specify that the permit would need to be renewed, or that the family would need to apply for an applicable second permit. A DDOT official goes into Ellen's permitting account to apply for the "renewal," unbeknown to her, and changes her password. He memorializes his hacking in an email. In October 2017, the parents will lodge a complaint with the FBI Internet Crimes Center. The PSC denies the "renewal application," DDOT's crude attempt to take an administrative shortcut to revoking a closed permit after a group of neighbors had complained about the tree house. No permit revocation documents are ever served. At public hearings, ANC 6B commissioners and senior DDOT officials dodge Bing's questions as to why the original building permit is not being respected. February 2016-November 2017: The parents appeal the permit application "renewal" denial at the Office of Administrative Hearings (OAH) and, eventually, the DC Court of Appeals. DDOT ignores Bing's requests for clarification of the status of the original permit, which the agency now refuses to recognize. DDOT fines the parents $8,000 for not "abating" the tree house from public space, with half a dozen Notices of Violation served in the wrong homeowner's name, to a "Mr. Lee" vs. a "Mr. Yee" (because all East Asian immigrants must be "Lees," like Bruce Lee...?). The notices are served via certified mail, meaning that post office staff will not release them to Bing. November 2017-January 2018: DDOT refuses court mediation at OAH, even though the lead judge has already lined up a mediator, and deemed the tree house matter "small." The Office of the Attorney General of DC (OAG) begins representing DDOT. After over two years of being on the receiving end of abusive administrative errors and shenanigans in public space permitting, Bing, a lawyer but not a litigator, and Ellen countersue DDOT. They also sue the senior public space management officials most involved in tree house permitting, DDOT's Matthew Marcou and John Stokes. The parents represent themselves in the first complaint they file in any court of law. The case is brought under the Federal Computer Fraud and Abuse Act (CFAA), and other causes of action before the statute of limitations on various causes of action is to expire. The parents' goal is simply to keep the tree house while their daughters remain in elementary school. Alternatively, they would like fair compensation from the City for tearing the fort down, to build a replacement entirely on their lot. February 2018: DDOT/OAG argues that the parents' lawsuit is "not ripe" in US District Court, illogically, after having asserted that the case "is moot" at OAH. The Court of Appeals dismisses DC's motion to throw out the appeal and refers the case to mediation. City lawyers begin to insist that there was never a "permit renewal" process. OAG attorneys now claim that the parents had actually applied for a 2nd permit, a (mythical but mandatory) "public space occupancy permit for balcony construction," denied by the PSC. Judge the quality of DDOT's legal arguments at Castle Paper Trail. March-April 2018: DDOT/OAG tries to get the Federal case dismissed. Mediation fails at the Court of Appeals, after DDOT refuses to leave the tree house alone for a few more years. OAG lawyers seem confident that they will get the entire case thrown out. We've stayed in litigation to protest how we did what permitting officials required of us to build a legal tree house. However, DDOT moved the goal posts on us as a result of internal dysfunction and administrative overreach. An arbitrary project screening system also set the stage for litigation. A paternalistic ANC had no business informing us that we should submit to City review to defend a closed construction permit, thereby abetting an unlawful permit revocation. Why not? Because DC Code 1-309.10(a), spelling out ANC powers, states that the commissions “may advise…with respect to all proposed matters of DC government policy…” Completed projects authorized by closed permits cannot be described as "proposed matters." If an ANC has an issue with a project covered by a closed building authorization the City hasn't lawfully revoked, the commissioners' quarrel is with the issuing agency, not the homeowner. 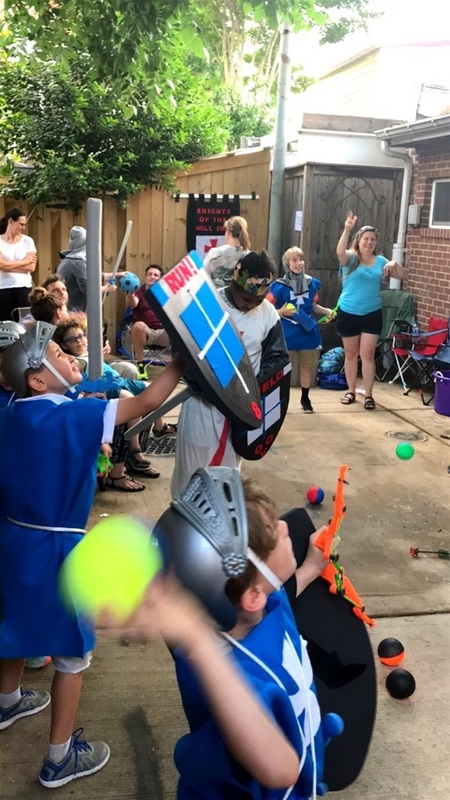 The City's permitting games to try to demolish a backyard fort have also been enabled by a failed regulatory process in a jurisdiction supporting a byzantine construction permitting scheme. DC's poorly explained and discretionary system for issuing (and withdrawing) homeowners' building authorizations, particularly those in public space and the DC Historic Districts, sets up a citizen to have real difficulty defending rights under permits covering small projects, e.g. garden sheds, fences and kids forts. This narrative not only chronicles the evolution of a knock-down neighborhood fight over a tree house, it proposes measures the City could take to prevent history from repeating itself when a family sets out to build a backyard play space. See Castle Paper Trail, Proposed Tree House Rules. The conflict hasn't been as much about a kids fort as lack of accountability to the public on the part of the DC permitting agencies. The story also encapsulates an urban community's struggle to balance the needs and interests of the old guard with those of the droves of young families putting down roots in neighborhoods. What else could explain why a kids fort a stone's throw from the Capitol Dome has attracted media attention? The story has not only appeared in the WaPo, it aired on four local TV stations in early 2016: NBC-4,CBS-7, ABC-9 and Fox-5. Three years ago, NBC affiliates broadcast footage of the fort from coast to coast. 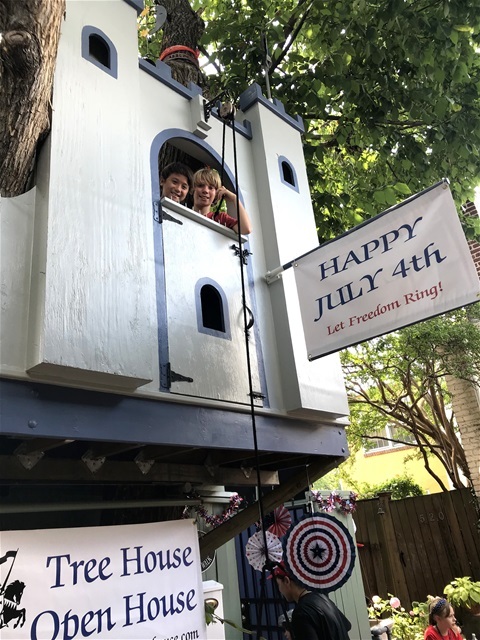 Since 2016, Hill families have stopped by the tree house after the local Independence Day parade on 8th Street, two blocks east. In January 2016, Slate Magazine's Nora Caplan-Bricker called the tree house "a monument to freedom." 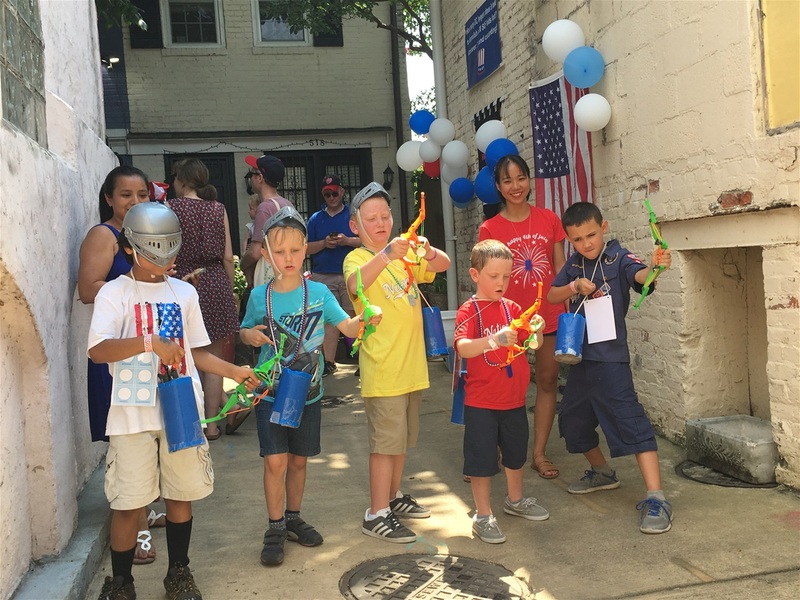 Each July 4th since, changing neighborhood demographics have been on vivid display in the alley as local kids, accompanied by parents and grandparents, have celebrated the play fort's survival. The open houses have each drawn 75-100 children, giving them a chance to explore in the elm at these low-key celebrations. We note that the former ANC 6B commissioner for the tree house property proclaimed to the press that we had dedicated public space for exclusively private purposes...with no benefit whatsoever to the public at large." The July 4th open houses have been fun for young families in the communty. Hill teens serve as monitors in the elm, helping keep young visitors safe. A rope-and-pulley controlled bird feeder system lets kids fill several feeders from the alley. Visiting children have fun playing Crusaders on the Walk in knights helmets. Inside the fort, visitors bang a gong, ring farm bells, peer through a toy telescope, blow bubbles, have tea parties, try out the climbing rocks on the tree trunk, raise a supplies bucket and draw on a chalkboard. Tree house frequent fliers mix with first-time visitors, from babies to grandparents. A few neighbors who once opposed the tree house join in. Each Independence Day that the play castle survives to see another community event feels like a victory over run-of-the-mill permitting abuses in the District. An adhoc nerf arrows archery range is a draw at open houses. Arrows are trapped nicely by the 15-foot-high walls of the historic Walker Dairy warehouses sheltering the south arm of Archibald Walk. 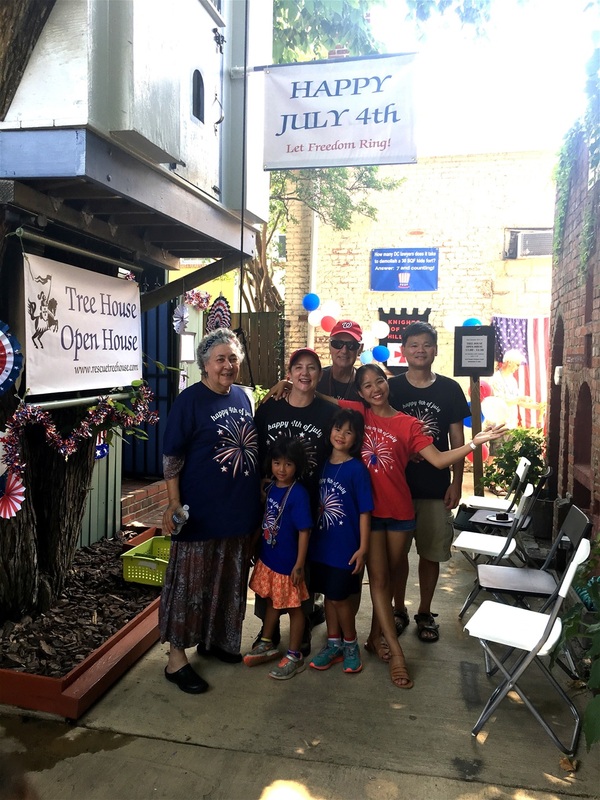 A new generation of Hill residents appreciates a little-visited Hill walkway (historically, "Marks Alley"), making happy memories of participating in Independence Day celebrations by the tree house. Thank you, Capitol Hill, for reminding us of why we strive to preserve a unique urban play space. If you attended an open house with your family, we hope that you and your children, or grandkids, had a good time and that we can welcome you back July 4th. Game of Capture-the-Castle, June, 2018. 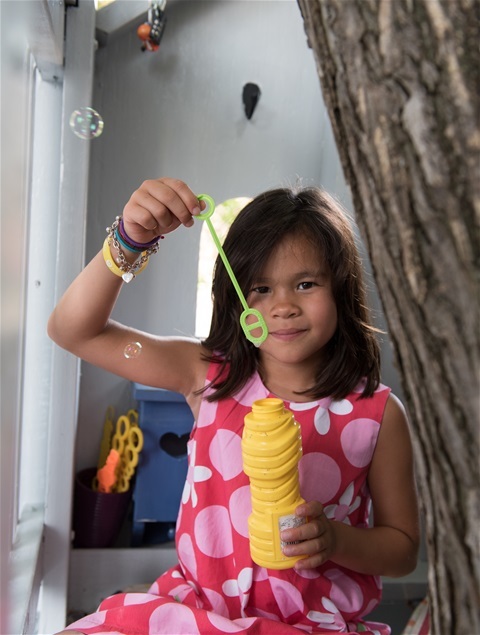 Neighborhood children have grown attached to the creative tree house at open houses, play dates, parties and birdwatching events. See Dress-Up Gatherings. We're concerned that, if this tree house is demolished prematurely, it will be the last built in a DC Historic District for a generation. The local historic preservationists who came at the structure would do well to explain how backyard play spaces pose a threat to ongoing architectural restoration efforts on the Hill. Which old building is threatened by a child's fort? We believe that the DC community can balance safety, heritage, public space and the need to promote outdoor play for children. 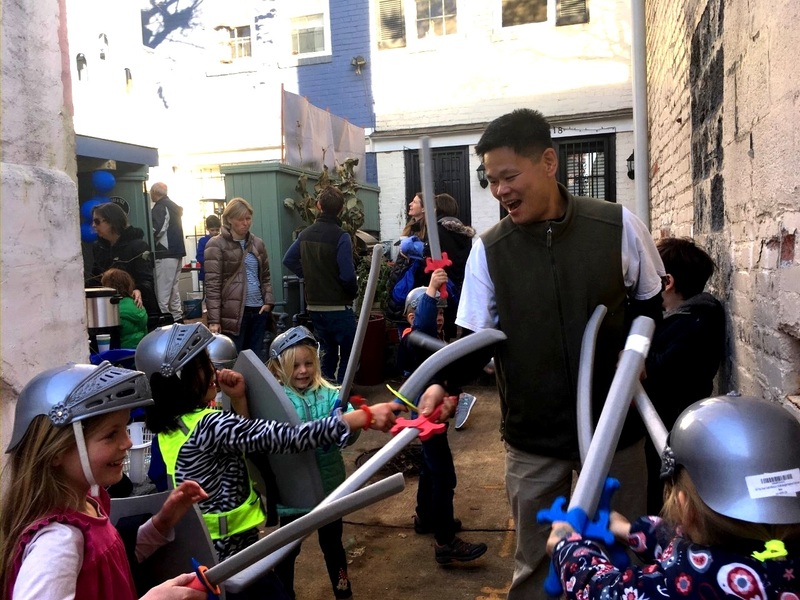 When City leaders help make the DC Historic Districts child-friendly zones, they encourage the young families making their lives in them to thoughtfully invest in their classic properties. One result is that parents become motivated to help the Department of Public Works maintain public alleys providing access to play spaces. The fall community open house was a wonderful time on a cold but sunny November afternoon. Neighborhood kids converged on the Walk, with (foam) sword fighting emerging as the most popular activity. More than 60 people rocked in to chat over pie and hot cider. A hard-working teen tree house monitor kept good order up in the elm, giving the grown-ups below a chance to relax. 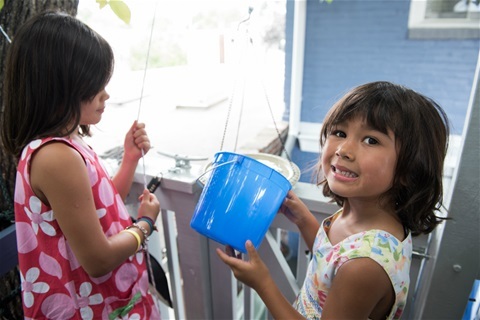 Alley visitors enjoyed filling the play fort's inventive pulley-and-rope-controlled bird feeders and bird bath. See Photo Gallery. What luck! 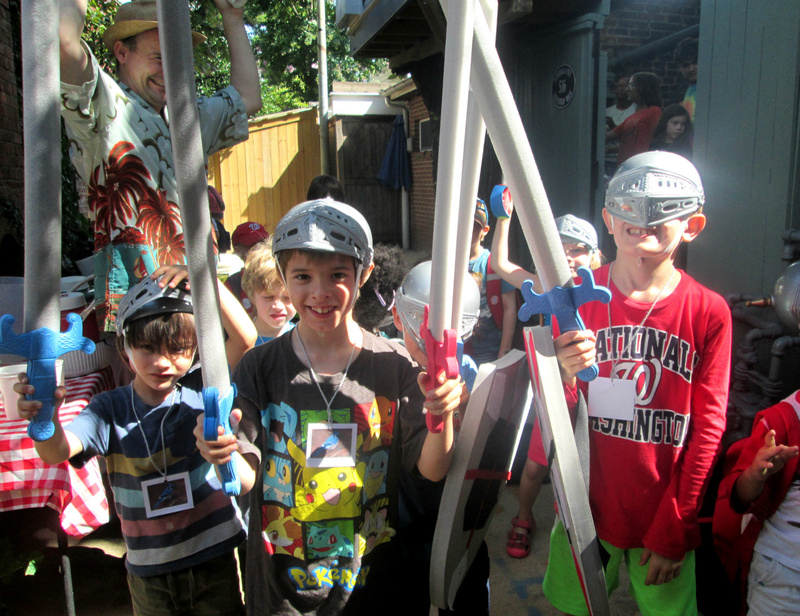 Seventy well-behaved knights from Mr. Tony's popular adventure camp, for ages 3-8, defended the castle in August. They had help from a dozen stellar camp counselors. The decade-old camp is a popular program for local children, serving hundreds each summer. The adventure campers honed their archery skills on the Walk and made pine cone bird feeders to take home. We really enjoyed hosting the adventurers on their epic visit. Come again! See Photo Gallery for more pictures. So why would alley neighbors, ANC commissioners and DDOT officials team up to seek the unlawful revocation of a permit covering a child's fort? 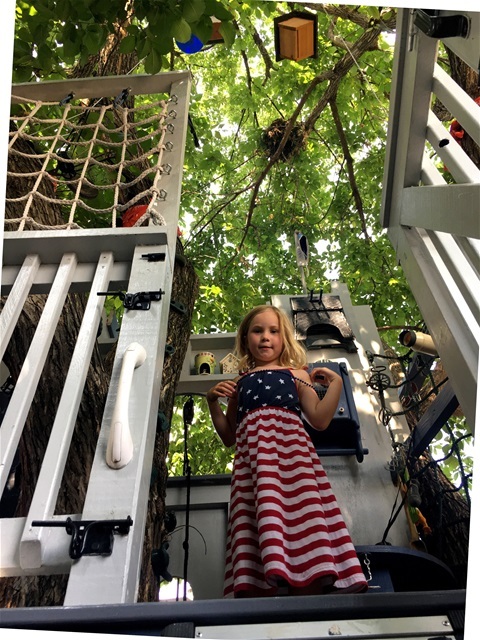 In the summer of 2015, Ellen and Bing worked to build a backyard tree house off the narrow "U"-shaped back alley. The open fort, which encorporates elaborate safety and security features was painted blue and gray to match their SE house. The structure was built in an environmentally-friendly manner. The family hired a DDOT Urban Forestry Division-recommended private arborist, to advise them on the care of their rare American elm, planted in the 1920s. Elms are uncommon in DC, because more than 80% succumbed to Dutch Elm Disease decades ago. You can see that the host tree is thriving: the elm is in much better circulatory health than when the tree house was built. Over the winter of 2015-16, ANC 6B got retroactive review of the family's construction permit on the agenda of a meeting of the Public Space Committee, a city-wide zoning commission. The Committee voted 4-0, with an abstention by DCRA-Construction, to overrule the permit, portending the tree house's immediate destruction. However, since the PSC lacks the authority to revoke permits, the Committee was not within its rights to vote at all. The Mayor's Order establishing the PSC didn't grant the body the power to withdraw permits. The parents were unaware of ANC and PSC overreach at the time, having been told by City officials that post hoc review was mandatory. They have since researched the relevant legal issues to mount a series of legal challenges. 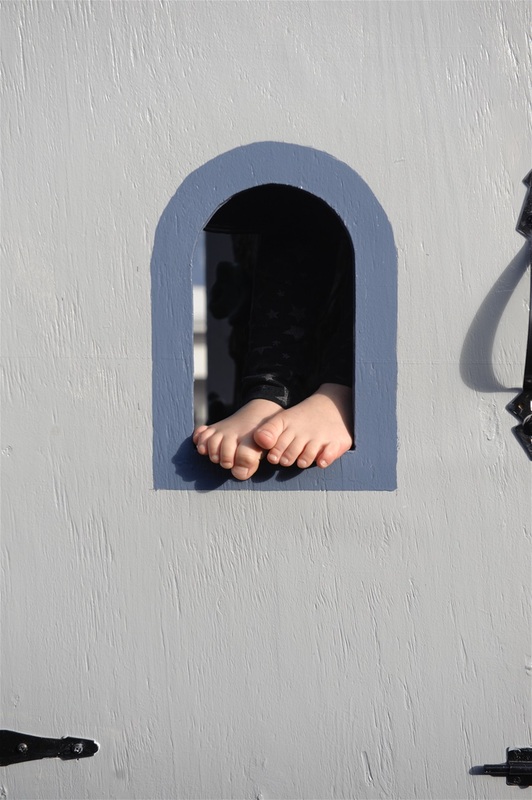 At the PSC hearing in January 2016, the Chair strong-armed committee members to vote to tear down the play fort, insisting that the parents should have gone through a (non-existent) process for permitting DC tree houses. But the window DDOT had to require the tree house builders to submit to City review was the time before they were issued a construction permit, versus after the permit had already closed out. Find the PSC's unfathomable letter announcing the PSC decision under Castle Paper Trail. Bing and Ellen have made good progress in litigation. After the PSC vote, they considered inching the fort's overhang over their land boundary to save it. Eventually, they reached the conclusion that the relocation project would be too hard on the elm, and that the shifted fort would be destabilized. Also, the parents had their eyes opened to post hoc City review of their project plans as a cynical effort to fool and pressure them to alter or destroy a legal structure authorized by a pre-existing permit. They prefer to stay in litigation than to acquiesce to an unlawful permit revocation scheme. The authors of the tear-down petition, which some of the immediate neighbors refused to sign, argued that because the tree house clashes with its surroundings architecturally, it should be demolished. Their petition reads "The castle-theme...is incompatible with the rest of the neighborhood and therefore antithetical to the historic nature and existing streetscape." 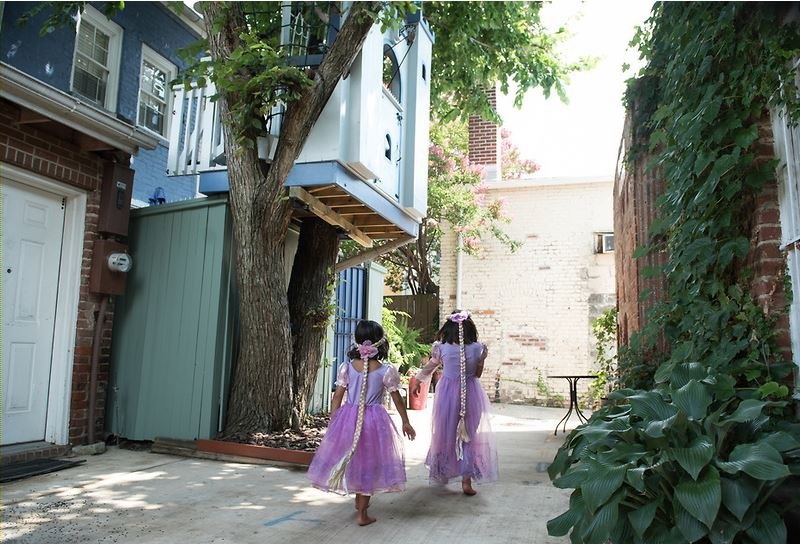 In supporting documents, made public by ANC 6B, neighbors expressed concern that the kids fort would attract vagrants, prove unsafe, depress property values, irreparably damage the tree (owned by Bing and Ellen), fall into disrepair, hurt alley tourism and compromise their privacy. But none of this has happened, helping explain why the campaign to destroy the tree house had petered out by late 2016. 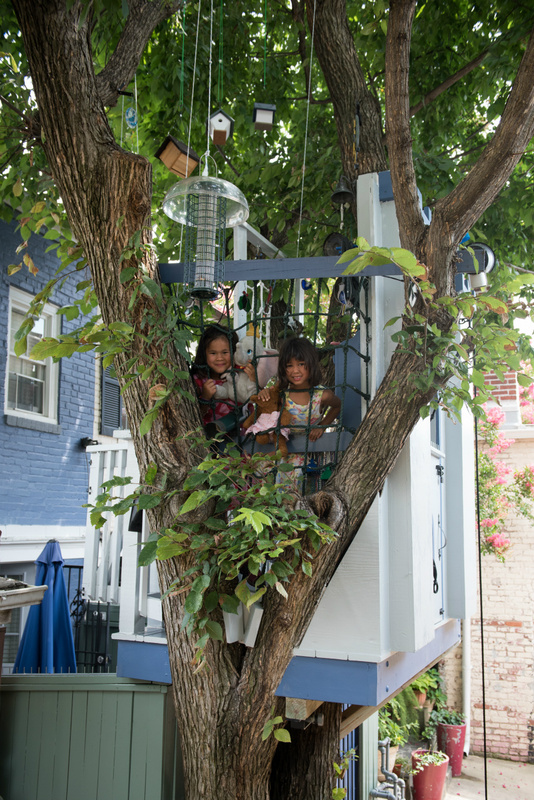 The backlash against what Slate Magazine's Norah Caplan-Bricker dubbed "DC Treehouse-gate" in 2016 suggests that the public at large has not been swayed by the argument that a small play fort off a Capitol Hill back alley should be destroyed. Local supporters have come forward to help the family in various ways. The American elm has been pruned by a professional tree care company without charge, and donations have been made. Supporters have included kids offering allowance money and Hill realtors who like showing the tree house to clients with young children. In late 2015, a DDOT inspector stumbled across dozens of large potted plants residents had been keeping in the alley for many years. The agency forced their removal, a development for which the neighbors blamed the parents. Their spokesman complained to the Post that the tree house "encroaches on" and "overwhelms" the public space...." Strangely, most of the neighbors who signed the tear-down petition can't see the tree house from their lots. Ellen and Bing would not only like to preserve the tree house, they'd like to see clear play fort-building rules enacted in DC. To this end, in 2016, they petitioned the directors of DCRA, DDOT, and the Historic Preservation Office for tree house construction rule making. See their petition, which the agencies ignored, here. The rescue operation has been an opportunity to raise awareness that there is no niche in the DCMR or DC Historic Preservation Rules for kids forts. The City categorizes tree houses as non-permitted "playground equipment" or "accessory sheds," overly broad categorizations creating permitting confusion over structures for kids going up in trees. The parents' committment to preserving the banged-up historic alley their fort overlooks has been made clear since 2011, when they lobbied DDOT to repave its very badly degraded surface. The paving project, the first in decades, improved alley conditions, particularly drainage. Archibald Walk was occupied by a large swarm of insects in warm weather before repaving. The family's contribution to keeping up the neglected narrow alley, which they often clean up, is apparent to long-time visitors. Without specific rules related to play or tree house-building in DC, unlike in many other US cities, the door is left open to permitting adhocery. More than one permitting official took the position that the fort's design broke none of the tree space rules for owners of adjoining lots, spelled out in DCMR Rule 24-109.3. The permit even references "the property owner's street box." In 2017, the rule was amended to read that a "structure" cannot overhang a tree space, surely as a reaction to the tree house war. With the amended rule, the law has been updated, meaning that no DC homeowner could build another such structure legally. Thus, no dangerous precedent for tree house-building in the District would be set by DDOT opting to leave this kids fort alone. Why is the Tree House Case in Litigation? Ellen and Bing have gone to court to defend rights granted by a permit DDOT came to regret issuing. Agency oficials opted to harness a bogus retroactive "review" of the authorization to tear it up. This type of casual permitting malfeasance, targetting ordinary homeowners who build small projects and probably can't fight back, is seldom challenged in the District. DDOT's "review" was government gone awry: the PSC Chair declared the tree house illegal to the WaPo in advance of the specious hearing, without even the pretense of impartiality. Afterward, media attention brought the family advice from real estate professionals wise to City permitting games. Architects and contractors reached out, urging the parents to challenge DDOT's bad faith, because, under DC law, a building permit like theirs is a closed chapter absent a legal permit revocation process. In the last several years, the whimsical tree house has become a community resource. Look for announcements of neighborhood open houses Moms on the Hill (MOTH) and the several Nextdoor.com Eastern Market area list servs. 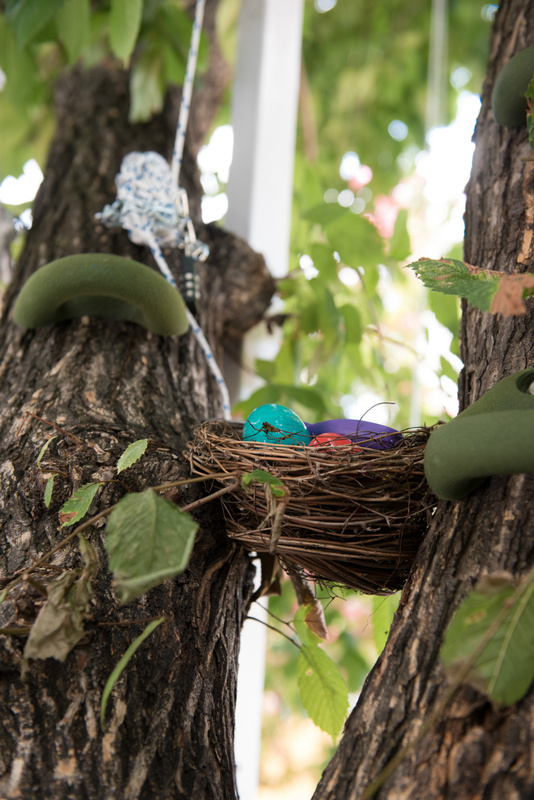 In addition to holding open houses, the family has developed the fort as a bird-watching platform for children. Occasionally, DC Boy and Girl Scout groups visit, to enable young naturalists to work on scout birding merit badges. Youth group, school group, and day camp leaders can send requests for small groups of children to visit the tree house. See Birding Activities. Come find the tree house! The unique play fort has become something of a Hill landmark since the 2016 media blitz. 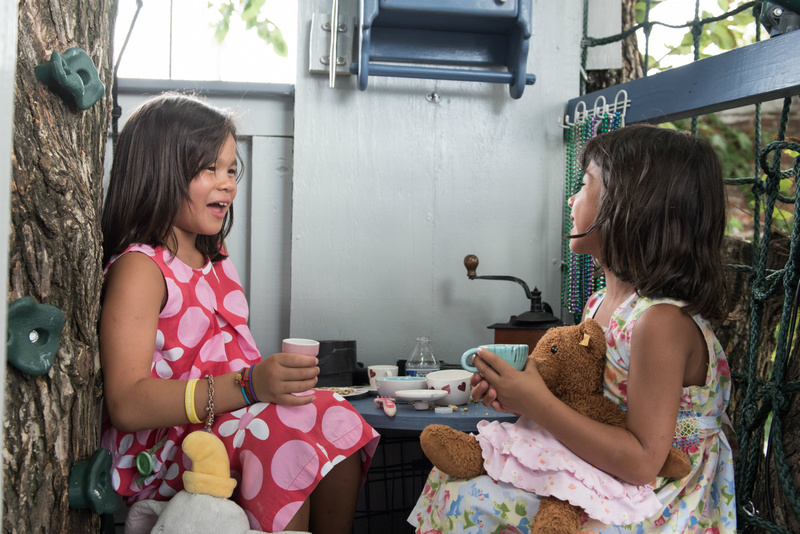 Ellen and Bing first opened the tree house to the public on Mother's Day Weekend 2016, during the Capitol Hill Restoration Society House & Garden Tour. The family invited tour-goers to explore the fort, prompting several hundred CHRS event ticket holders to stop off at their SE patio. The guided Capitol Hill Food Tour, and the "Barrack's Row Tour of Duty" walk, often bring tourists by the tree house. The authors of the tear-down petition argued that the struture "impairs the public use and enjoyment of this space...and the enjoyment of neighborhood tours which transit Archibald Walk" with the fort "disrupting the integrity and visual beauty of the alleyway." Their view has not been universally shared. Local tour guides will tell you that visitors sometimes ask to be shown the sweet tree house they saw on TV news a few years ago, or read about in the Post. Tourists walking by snap pictures and call out encouragement to kids to "Defend the castle!" Having trouble finding the tree house? Try searching for "East Archibald Walk" on Google Maps, where a photo of "Tree House of Contention" may pop up at the bottom of the screen. If you don't plug the "East" into your GPS, you may not be directed to one of two alley entrances off F St. Terrace behind Christ Church, paved in gray asphalt pavers, running north to south between E and G Streets SE, behind Christ Church. Going forward, the construction of tree houses should be regulated in the District, but in a way that encourages families to build them responsibly to promote outdoor play. In a society where most urban youth spend too much time inside, the City should not be in the business of encouraging sedentary lifestyles for local children by making backyard kids forts difficult to build, and even harder to preserve. Discouraging homeowners in the DC Historic Districts from building tree houses is short-sighted in a city with many large trees in residential neighborhoods. The unlawful revocation of building permits by the government is another losing strategy in a municipality that has long struggled to rein in abuse of authority and dysfunction on the part of its administrative agencies, dampening statehood prospects. Homeowners in the District have a right to know exactly what they are, and aren't, allowed to build, no matter how large or small a construction project might be. To urban tree houses as places of joy and discovery! Thanks for stopping by. Capitol Hill visitors and residents who haven't seen the tree house, please come find it and draw your own conclusions.